People across the globe are giving final touch to the preparations of 12 Rabi ul Awal celebrations. It marks the birthday of Holy Prophet Muhammad (Peace be Upon Him) and is celebrated every year by all the Muslims around the world. To celebrate this event, government and religious organizations in all parts of the world plan different activities which include, Mehfil e Milad, programs on Sirat-un-Nabi, seminars and conference to discuss and celebrate this annual event. Muslims decorate and lighten up their houses, bazars, buildings and masjids with beautiful / colorful lights and green flags to show their love for Prophet Muhammad (Sallallahu Alaihi Wasallam). Celebration of 12 Rabi ul Awal is not limited to elders only, youngsters and kids also actively participate in the joy and happiness of this blessed festive. Government of Pakistan also facilitate people in celebrating Eid e Milad. They provide them security as well as designate them areas to enjoy this Eid. Noor Ka Samaa is one of the biggest and most popular Mehfil that is held in Pakistan. Naat Khawan from around the country participate in this event and there is also a give away of an Umrah ticket. If we go to the history of Jashne Milad then we will come to know that this occasion was also celebrated at time of Hazrat Muhammad (Sallallahu Alaihi Wasallam). HE (Peace be Upon Him) birth is a big blessing for all the universe and his preaching is true guidance for everyone. 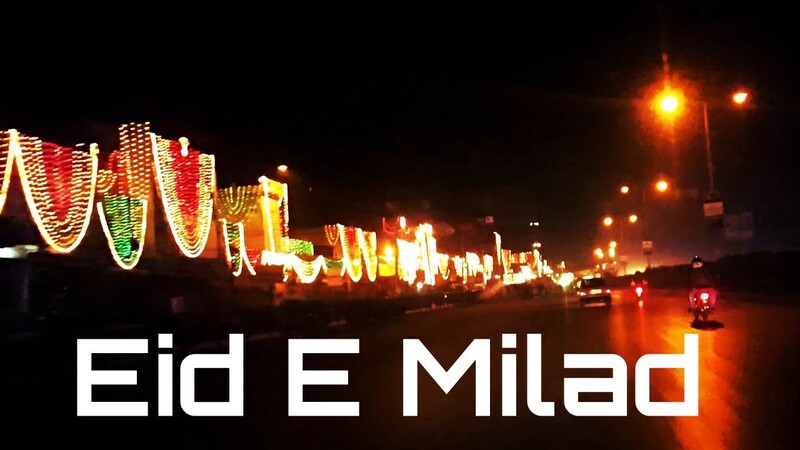 Like Eid ul Fitar and Eid ul Adha, on 12 Rabi ul Awal people also share Eid Milad un Nabi mubarak images, wishes, greetings and quotes with their brothers, sisters, parents, friends and relatives. To make poor part of the Eid Mawlid celebration, people distribute sweets and food among them. It is one of the most happiest and joyest event celebrated by the Muslims. It is a blessed day so don’t forget to recite Darood e Pak, offer nawafils and pray for the good health, happiness and prosperity of all your loved and dear ones. Wish everyone the birth of our beloved Prophet (Peace Be Upon Him).